Since 1963, Aluminum City has been providing Escondido with customizable patio covers, window awnings, carports, room enclosures, and door hoods at budget friendly prices. We are a factory-authorized dealer of Four Seasons Building Products, one of the largest manufacturers of outdoor shade systems in the country. Their products feature structural aluminum of unparalleled quality, as they are thicker than the industry standard and primed before painted. When used in the manufacture of patio covers, patio rooms, and carports, these products are proven to be more durable and retain their beautiful finish longer. In fact, nearly every one of the patio covers, awnings, and other shade systems that we installed decades ago continues to look great and function beautifully. As a full-service patio cover company, Aluminum City will help you with every aspect of your patio cover, carport, window awning, door hood, or patio room project. Prior to starting any project, one of our owners visits the client's home or business to provide a comprehensive consultation, take measurements, and issue an upfront estimate. Upon approval, we will put you in queue for installation. Installation itself may take one day or a few days depending upon the scope of the job. Large commercial projects in Escondido, such as 100-car carports or custom window awnings for a 50-unit apartment complex, may take longer, but will still be done in a timely manner so that we meet your deadline without compromising quality. When you work with Aluminum City, the owners will not only be heavily involved – they'll be doing all the work themselves. Our owners have 30+ years of experience selling, designing, installing, and replacing patio covers, window awnings, door hoods, carports, and patio rooms in Escondido, and will use their extensive skill and expertise to ensure you get the best possible return on your investment. 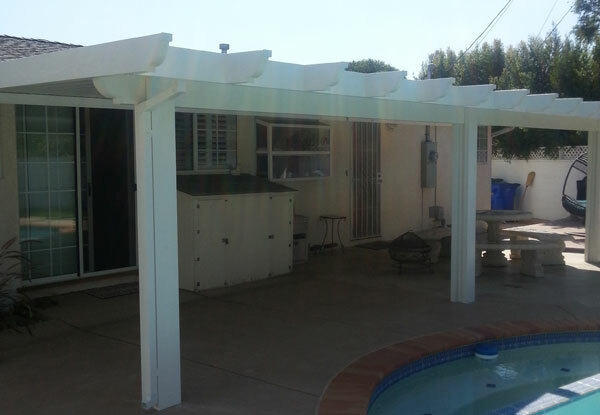 Plus, you can be sure that you are getting the best possible rates; without any salesmen, other employees, or subcontractors to pay, Aluminum City is able to offer its Escondido clients prices that are significantly lower than those of nearly any other patio cover companies in San Diego County. Call today to schedule your on-site consultation in Escondido. Aluminum City is licensed, bonded, and insured, and available seven days a week, from 7am to 10pm. We have thousands of satisfied residential and commercial clients throughout Southern California and an A+ rating from the Better Business Bureau. Whether you want to keep your home cooler on hot days or reduce the amount of sun on your outdoor seating area, Aluminum City's patio covers will be a great addition. Since 1973, we have provided Escondido homes and businesses with sophisticated, durable, and long-lasting patio covers that compliment, protect, and cool patio spaces of nearly any size. Since we use high quality aluminum that is primed and painted, our patio covers are structurally sound and will never rot, rust, or be susceptible to termite damage. Our versatile patio covers come in solid or lattice styles, a wide array of designs, six different colors, four end cuts, and smooth or wood-grain finishes. Additionally, you can add on lighting fixtures, ceiling fans, or a skylight. Call us today to learn more about our custom patio covers in Escondido. Since 1973, Aluminum City has provided our Escondido customers with attractive window awnings and door hoods at incredibly affordable prices. Our window awnings are made from 3.5" slats that are connected at a 45 degree angle so that they provide exceptional sun protection and shade. These slats are available in 20 different colors that can be mixed and matched to create solid, striped, or multi-colored awnings. Our door hoods are very similar in construction to our window awnings, except that they are designed to allow room for the door to open and close, and also feature return side wings for added sun and rain protection. By installing Aluminum City's window awnings or door hoods on your home or office building, you'll not only increase its curb appeal, but you'll also reduce the amount of sun that enters your window, which helps to protect furniture and carpet that would otherwise fade from constant sun exposure over time and reduce indoor temperatures. Trust the professionals at Aluminum City to design and install your custom window awnings and/or door hoods for your Escondido, California home or business. Aluminum City offers its Escondido clients an affordable way for you to protect your car from the elements with our durable, long-lasting carports. Since 1963, clients have chosen Aluminum City because we offer superior quality aluminum products and expert installation at an unbeatable price. Our carports are made of thick, structural aluminum for lightweight durability and feature a baked on primer under its paint for added protection against rust, rot, flaking, fading, and bubbling. 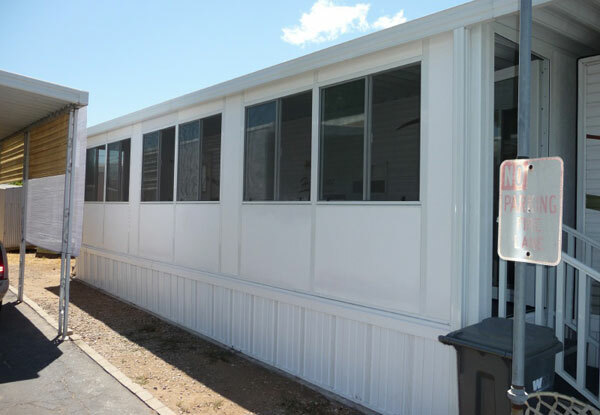 Whether you are looking to install one of our carports for a home, mobile home, or business, all our work will be done to code. Carports can be freestanding or surface mounted, and built to nearly any size. Call today to learn about our competitively priced, durable, and long lasting carports. Aluminum City helps Escondido property owners expand their indoor square footage at an incredibly cost-effective price with its custom-built California Rooms. California Rooms are complete rooms that are usually built over a deck or patio area and consist of a solid, insulated roof and four insulated walls with glass windows and sliding, French, or regular glass doors. As with any room addition, California rooms are built to code, have an environmentally friendly gutter system, and can have electrical runways so that ceiling fans and lighting can be installed. Or, for additional natural light, you can feature a skylight or two. All windows have dual-glaze, low-E glass and walls feature a foam core for impressive thermal insulation. To learn more about our California Rooms available for Escondido homes and businesses, call Aluminum City today. We offer free onsite estimates to all of San Diego County, and are licensed, bonded, and insured. Excellent impression right from the beginning. Red showed me what went wrong and told me how it should be done. Now I have a beautiful porch roof that is far and away better. I highly recommend Red, Ed, and Robert for this work.